WordPress is one of the popular content management systems in today’s blogging society. It is also the first platform I use to blog my cooking experience. It is convenient and straightforward process. 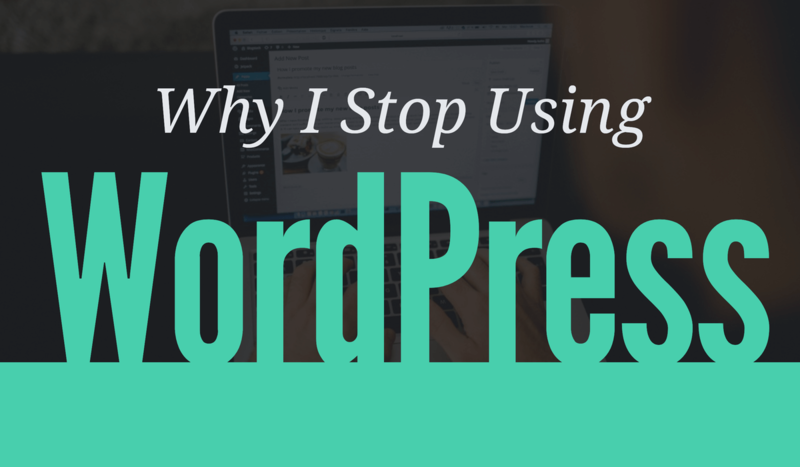 However, there are few things that I don’t like from WordPress. If I have to choose between WordPress.com and WordPress.org, I will choose WordPress.com. Why? Because WordPress.com takes care the backend infrastructure of WordPress content management system, ensuring you get the best out of WordPress. They also offer custom support. However, the plans are not affordable for me. The best plan that suits my needs is a business plan which costs about C$ 32.45 monthly. I have 5 websites alive at the moment. If I ever use Wordpress.com, I need to spend about 1,945 Canadian dollar yearly to host each custom domain website which I cannot afford. So WordPress.com is out of the picture. Self-hosted Wordpress.org is more affordable than Wordpress.com. However, the process is a little bit tedious. I once bought a hosting plan for a year to host my two websites few years ago. I hated every minute working with cPanel. I had to install Wordpress, search and upload themes, and find the best plugins for my websites which took a lot of my time. Not to mention the time I spent working on the website increased every time the website was down. Just like any other content management system, Wordpress is vulnerable to attack because of the way it operates, processing user input and storing it on the server that will make it more vulnerable to a breach. In addition to that, many plugins are outdated and may not be compatible with the Wordpress updates, making it an easy target for hackers. I am also familiar with the website hacking. So if I can hack my site, any hacker can easily too which makes me worry. Unless I have hundreds or thousands of dollars to spend for managed Wordpress hosting plan to get the security issues under control, I have no plan to use Wordpress.org (self-hosted WordPress) in the near future. If you are just spending $10 per month to host your Wordpress site, I guarantee your site will be slow. Wordpress needs more resources to make it load fast. Sure a few visitors a day won’t affect the speed, but it is still considered slow compared to static generator sites such as Hexo or Jekyll. Also, you will need to have high level of technical knowledge and require expensive managed Wordpress hosting plan to be able to handle a huge web traffics. Although I have the technical skills, I still cannot afford to pay for pricy managed Wordpress hosting. So Wordpress.org (self-hosted WordPress) is not my solution. I do enjoy working with Wordpress site on Wordpress.com. It is easy and straightforward process to just sign in and write. But I prefer to use blogger.com over Wordpress.com when it comes to blogging using sub domain, because I can host ads on blogger.com subdomain. However, I don’t like working with self-hosted Wordpress. Last time I used self-hosted Wordpress, I had to spend extra time updating themes and plugins also had to work on other things inside of the cPanel. It was frustrating process. All in all, Wordpress.com business plan is the best option for those who are serious about their business and blog adventure. Although Wordpress.com may cost you a fortune, they offer a lot of support and have the best infrastructure to make your business journey thrive. As for me, this was not what I was looking for. Gladly, I found another alternative that was suitable for me; that is Hexo static site generator. Stay tuned for my next blog post about Hexo.